The leadership of the Deeper Christian Life Ministry has suspended the son of the General Superintendent of the church and his wife, John and Love Kumuyi from carrying out any activity in the church over their recent controversial wedding in Jamaica. John and Love wedded in Jamaica on 15 June, 2013 and thousands of members of the church have reacted sharply while condemning the wedding gown worn by the wife and other aspects of the wedding that were at variance with the church’s standard. She was decked in attires quite different from the acceptable standard set for Deeper Life members by the church. Love was arrayed in flowing gown with a veil to match, while lots of people said her hair wasn’t natural and that she applied lipstick as part of the make-up. 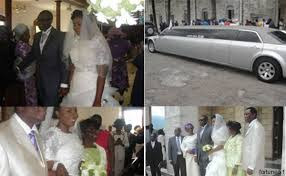 Also at issue was the hiring of a Limousine which conveyed the couple to their destination after the wedding. And a huge cake was cut during the wedding contrary to the church’s tradition. Due to the myriad of controversies generated by the wedding on social media, Facebook, especially by members of Deeper Life, the church decided to place the couple on suspension to give them time to pray and seek forgiveness from God for their action. On Saturday, at Deeper Life’s monthly miracle and revival programme held at the Deeper Life Conference Centre, DLCC, Lagos-Ibadan Expressway, John and Love’s suspension from church work was announced to the over 50,000 Deeper Life faithful at the event by Pastor Philip Oluwi, a key leader in the church. 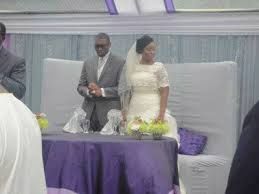 Oluwi, certainly is acting on the instruction from the General Superintendent of the church, Pastor William Kumuyi, to suspend the couple for the embarrassment they brought upon the church during the wedding, emphasizing that the standard of Deeper Life regarding wedding and moderacy had not changed. “The church, Deeper Life, remains committed to the biblical practice and standard of almost 40 years Christian dressing and still remains and does not compromise on biblical Christian dressing. “Hence, deviation warrants the displeasure and frown of God and the leadership of the church. John and Love are now under discipline,” Oluwi announced to the entire congregation, an action that helped to calm the nerves of many Deeper Life faithful. Who joined them in the HOLY Matrimony?? Was it not in the deeper life church?? Was the Dad nd Mom not aware of d wedding plans?? What of the pastor that joined them?? ABEGI,, lets this Children enjoy themselves jare, let allow God to guide nd us in everything we do! !